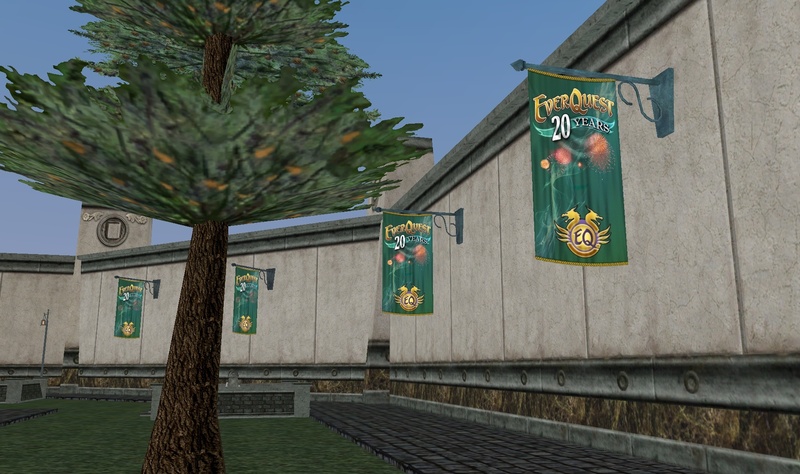 The EverQuest 20th Anniversary is today and, while I thought I said what I had to say yesterday, here it is today and another post. I guess it is kind of a big deal, so I can post about it today too. And probably tomorrow. Plus Daybreak made this nice 20th anniversary image. When I got up this morning the EverQuest site was down for maintenance. Daybreak is in the same time zone and I am sure they were up earlier than I was getting things ready for the big day. EverQuest itself was up and running, though the Mangler and Selo servers were not yet available. (The EverQuest II side of the house was more on the ball I guess, as the Kaladim and Nagafen servers were reported up pretty early.) But that was fine. I wasn’t planning to join in on either of the EverQuest servers. Instead I got on my current character on the Vox server and found the Plane of Knowledge already decorated. There are the usual things around like special vendors, bonus XP, and anniversary events, both new and historical. Not too long later the EverQuest site was up again, sporting a new design for the anniversary. The anniversary was front and center of course, including some news about events. 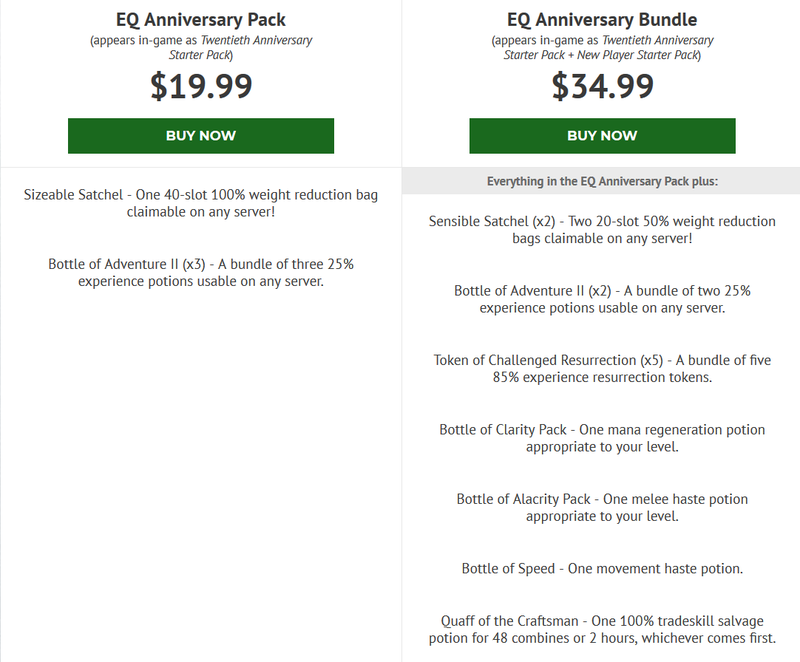 The site was also pushing special 20th Anniversary packs for $20 and $35, both of which illustrate the problem I have with the EverQuest cash shop. Basically, you can get a bag and three rather mild XP potions for $20, or add on two smaller bags and a series of other dubious potions for an additional $15. I guess, in the context of the EverQuest cash shop those are not bad prices, but I am also familiar with the EverQuest II cash shop, where I find the items, options, and pricing much… more to my tastes I guess. This comes up every expansion season as well, where I find that I would be tempted by the deluxe editions of the EverQuest II expansions, but the addons for EverQuest seem so tepid. Basically, $20 for a bag, even a big 40 slot bag, seems like a lot. But the in-game cash shop sells a 28 slot bag for $18, so I guess it is a deal in that context. And maybe if I were more invested in the game, or less aware of its younger sibling, I might be okay with it. Inventory management is a big chore in the original game, and awkward compared to more modern games as well. Anyway, I decided to spend at least some time playing EverQuest on the anniversary. I’ll be running around in the daily hotzone quest area soaking up some XP with my mercenary tank. There isn’t much else I can indulge in at my low level. I’ve already managed to go from level 17 to 21 in not too much time this morning. Of course, now my inventory is full of crap. I guess I can see the point of the bags. Events, deals, and bonuses run through the end of the month, so I guess I didn’t have to jump right in today. But I figured I had jumped right in on this day 20 years ago, so why not? Addendum: There is also a 20th anniversary Producer’s Letter complete with infographic. Of course I saved the infographic because they tend to disappear over the years. (See yesterday’s post for some of those.) You need to click on the infographic in order to be able to read it. 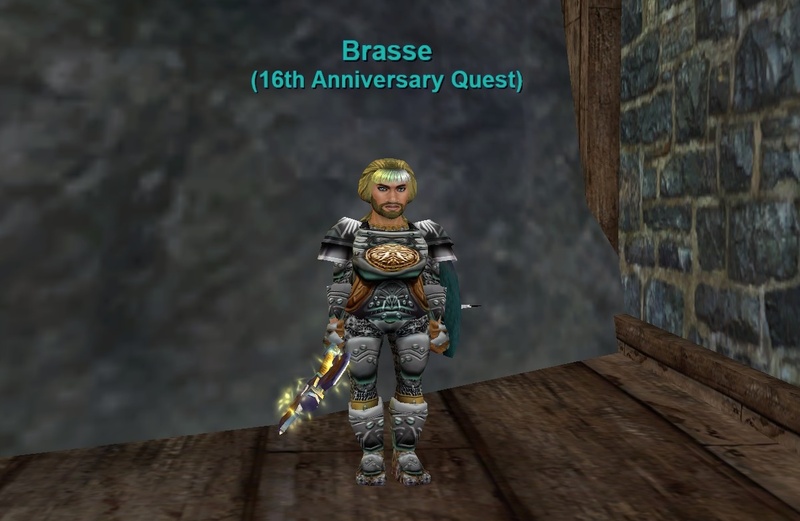 This entry was posted in entertainment, EverQuest, EverQuest II and tagged Meaningless Milestones on March 16, 2019 by Wilhelm Arcturus.